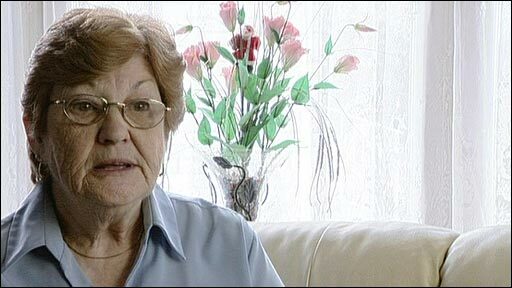 Yvonne Dalton, speaking in 2009: "The skin just started peeling away"
A number of High Street chains have agreed to pay up to £20m ($31m) to 2,000 people who received chemical burns from anti-fungal agents in sofas. The victims are expected to get £1,200-£9,000 each plus other expenses for loss of weddings, holidays and wages. The group that owns Argos and Homebase, furniture chain Walmsleys and other smaller firms had admitted liability for selling the Chinese-made sofas. Some Land of Leather customers will not get a pay-out, after an earlier ruling. Richard Langton, solicitor for law firm Russell Jones and Walker, said: "People's lives were put on hold. Some people thought that they were dying, that they had skin cancer. "Their doctors couldn't tell them what was wrong, a lot of psychological symptoms. "Some cases were not so severe, fortunately, but for many people they say it was the worst period of their lives ever." Mr Justice MacDuff was told in court that a "claims handling agreement" had been reached that did not resolve the whole of the litigation, but would "open the way to swift compensation for many hundreds" of people. Mr Langton said there would be another hearing on 21 May when 2,500 further cases would be considered. The £20m figure includes legal costs, as well as compensation. 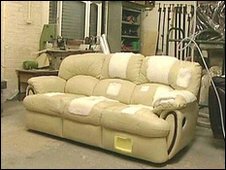 Up to 100,000 of the sofas were sold with "highly sensitising" fungicidal chemical dimethyl fumarate (DMF) inside. The substance was designed to stop the furniture, manufactured by Chinese companies Linkwise and Eurosofa, going mouldy in storage. When the sofas went into people's homes the solid sachets turned into gas that burned through clothes and on to skin. The claimants were said to have suffered severe skin or eye complaints, breathing difficulties or other medical conditions. Solicitors said the EU had now banned the use of DMF after consumers in at least five European countries suffered skin burns and breathing problems. Another High Court judge previously ruled more than 300 customers were not entitled to compensation from Land of Leather's insurers Zurich, after the furniture firm went into administration in January 2009. That decision is expected to be challenged in the Court of Appeal.